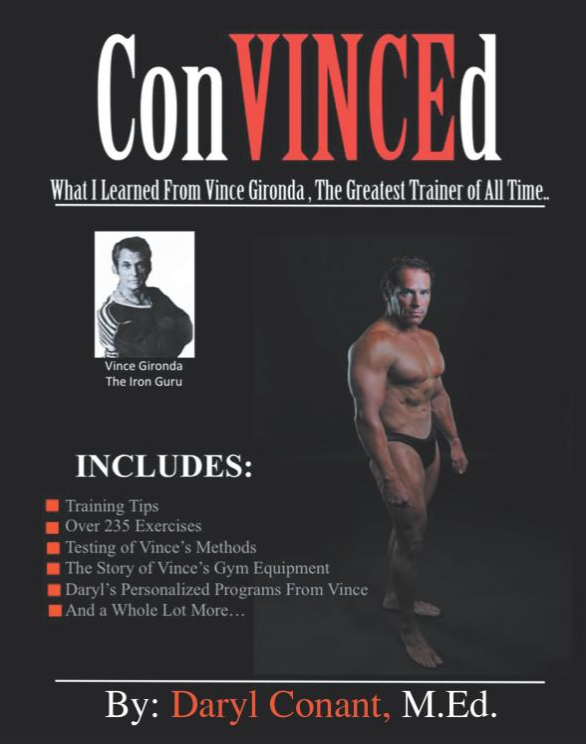 ConVINCEd is an encyclopedia of Vince Gironda’s true natural bodybuilding methods. Daryl Conant has put together a comprehensive book that features all that he learned from Vince. Topics covered include nutrition, training theory, as well as 235 of Vince’s exercises. Thanks Daryl for writing this great book. I have known about Vince for years but your book fills in many of the missing pieces to Vince’s methods. ConVINCEd is a great resource. Daryl, I have been watching your videos online showing Vince’s exercises and they have helped me gain a better understanding on how to do the exercises correctly. I purchased your book to learn more and I have to say it was one of the best investments I have made. The amount of information you provide is incredible. The detailed descriptions of the exercises helps a great deal. Thank you for sharing your experience with Vince and keeping his legacy alive. Keep up the good work! ConVINCEd is a must have for anyone wanting to learn about Vince Gironda’s methods. Great book! I purchased ConVINCEd to learn more about Vince and I didn’t expect such a great resource of information. My son and I have started using the programs that you described in the book and we have made great gains. It’s great to be able to workout together, naturally. I haven’t felt this excited about training in a long time. Thanks Daryl for this spectacular book. Daryl, ConVINCEd is a masterpiece. Keep up the great work. Daryl provides insights on Vince Gironda’s teachings which result in gaining results you wouldn’t using other training principles. Bill Pearl noted years ago when a trainee couldn’t get results, he’d send them to Vince. Today Bill would suggest get ConVINCEd.